When President Obama took office in 2009, the U.S. was in trouble — 50.7 million people were uninsured, the largest number in history. Mortality rates were on the rise, even as health care spending grew faster than the nation’s economy. Obama was always going to address the situation through some type of health care reform, Jason Furman, chairman of the president’s Council of Economic Advisers, said recently. As the number of days left in Obama’s presidency approaches single digits, it’s clear that part of his legacy will be that his administration implemented the biggest health care overhaul since the creation of Medicaid and Medicare. What’s less clear is how those changes will be viewed years from now — and part of that depends on what happens next. Republicans have tried to repeal the Affordable Care Act dozens of times since the law was pushed through Congress in 2010 without any support from GOP lawmakers. The party has pledged to immediately repeal the law (or, more likely, defund it) as the new session of Congress opens today, though they will likely delay the effects of the repeal and don’t yet have a replacement in place. When they do take action, lawmakers will have to contend with the massive changes the health system has already undergone as a result of Obama’s health care bill. But understanding what changed in the U.S. under the ACA is no simple feat. We have plenty of numbers, sure, but part of the trouble is that assessing health care policy is a largely ideological affair — there are always winners and losers, and the trade-offs that seem reasonable to one group can look disastrous to another. And how Obama’s signature health legislation is viewed decades down the line will likely be informed as much by what happens next as what has happened so far. Still, a good place to start assessing the program’s likely legacy is by examining three metrics often used to judge health policy: coverage, cost and quality. The ACA increased insurance coverage everywhere, among every demographic group, but just a quarter of the population knows that the uninsured rate is now at an all-time low. About 20 million people gained insurance as a direct result of the law, according to the Department of Health and Human Services. But while the country has seen net gains in coverage, it has been a bumpy road for some. The group of people who are newly covered under the ACA includes about 16 million low-income people who gained Medicaid, which was expanded under the law to cover anyone with an income that is less than 138 percent of the federal poverty line. Not everyone in that group is now eligible for Medicaid, however. After a Supreme Court decision determined that states could decide whether to expand the program, 19 states opted not to, creating a deep geographical divide among low-income people. About 2.5 million people fall in this “coverage gap”: They live in a state that didn’t expand Medicaid, and their incomes are too low for them for them to qualify for federal subsidies in the ACA-created insurance marketplaces where people can buy private insurance. Critics warned that the law, which required large employers to offer insurance to employees who worked a certain number of hours, would be a job-killer. They were also concerned that it would push people off of work-based insurance by leading employers to cut hours below the threshold where offering insurance was mandatory. While those doomsday predictions didn’t come to pass, it does appear that some employers limited the hours of workers who were already part-time. For those part-timers and others, the process of buying insurance became easier with the advent of the insurance marketplaces, which allow people to compare plans. Still, of the 5 percent of Americans who bought plans outside an employer or a government program before the law passed, millions had their policies canceled, despite the Obama administration’s infamous promise that people who liked their health care plans could keep them. Those losses were partly the result of insurers phasing out plans that didn’t meet the new federal requirements for coverage — requirements that are controversial, because while they mean more comprehensive coverage, they can also mean higher premiums, which can be a turn-off for the young, healthy adults who are needed to balance out insurance pools. The Congressional Budget Office, a nonpartisan analysis arm of Congress, recently explained that at least some of the old, less-comprehensive plans would not count as insurance coverage because they don’t offer sufficient financial protection. Among those who gained insurance were people with pre-existing health conditions. 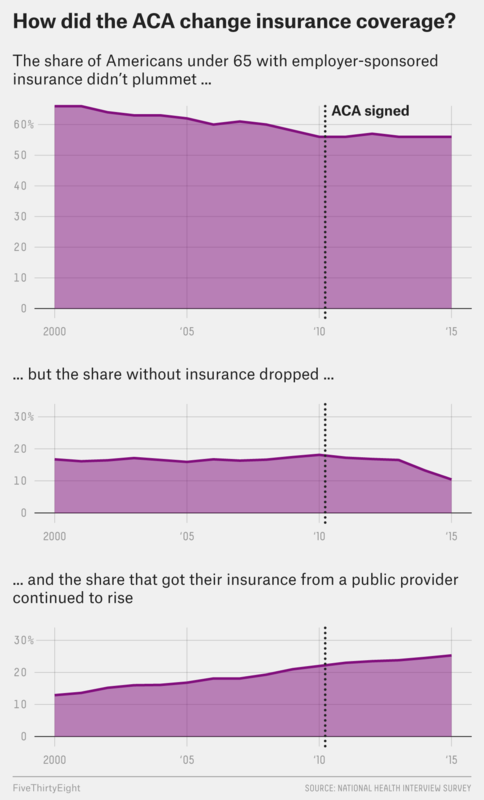 Before the ACA, insurance companies could choose to deny coverage to people on the private market, and they often did so for people who had diseases that are expensive to treat. The new law banned that practice. The Kaiser Family Foundation, which researches health care policy, recently estimated that 27 percent of adults younger than 65 would be uninsurable and that millions more could be denied coverage for specific health issues under pre-ACA, private-market norms. While many of those people have insurance through an employer or public program, they would previously have been left without options if they were to lose that insurance. Despite challenges relating to cost and market participation from insurers, the insurance markets set up by the ACA are gaining steam. Approximately 6.4 million people have signed up for 2017 insurance coverage through the federally run marketplaces (even more have signed up on the state-run exchanges; 2017 numbers aren’t yet available, but more than 12.6 million selected a plan during the open enrollment period for 2016). That’s a record number, even as premiums increase by double-digit percentages in many places. About 85 percent of those people will receive federal subsidies that help offset the rising prices, but middle-class buyers can easily pay more than $1,000 per month. But although the specifics of how people are covered have been shifting, the absolute increase in the percentage of people with health insurance is the blinking red data point that legislators will have to reckon with as they gear up to change, eliminate or replace the ACA under President-elect Donald Trump’s administration. Polls suggest that a growing number of people want to see the law scaled back, not repealed, and however unpopular the ACA is, taking away newly acquired insurance is likely to be controversial. Topher Spiro, vice president of health policy at the liberal think tank Center for American Progress, helped write the law. He said he thinks that because so many people are now insured, expectations regarding access to insurance have changed, which will lead to increased insurance coverage being part of Obama’s legacy, even though the GOP has pledged to repeal or defund the health care bill. “There’s no doubt in my mind that in the long term, there will be many more people insured as a result of the Affordable Care Act,” Spiro said. It’s impossible to know if he’s right, but the trepidation that some Republican legislators have recently expressed about repealing the law without a replacement plan in place suggests that he might be. The increase in coverage has come at a price, but not everyone agrees on what that price is. There are a lot of ways to measure health care costs — what the nation is spending overall, what the government’s share of the bill is, how much individuals pay out of pocket for premiums and other costs, and how much medical debt people are carrying, just to name a few. Total and per capita health care spending increased over the last eight years, which isn’t particularly surprising since 11.6 million more people had insurance in 2014 than 2013. The growth in the cost of care per person enrolled in health insurance slowed during that time, however, for all types of plans. Take prescription drugs, for example. People who got insurance under the law were more likely to fill prescriptions and paid less for the drugs than they had previously. Spending on pharmaceuticals as a share of GDP dipped slightly after 2010, but by 2015, prescription drug costs accounted for 1.8 percent of GDP, the highest percentage in history. The ACA isn’t responsible for the high cost of drugs, but the law did little to stop it. 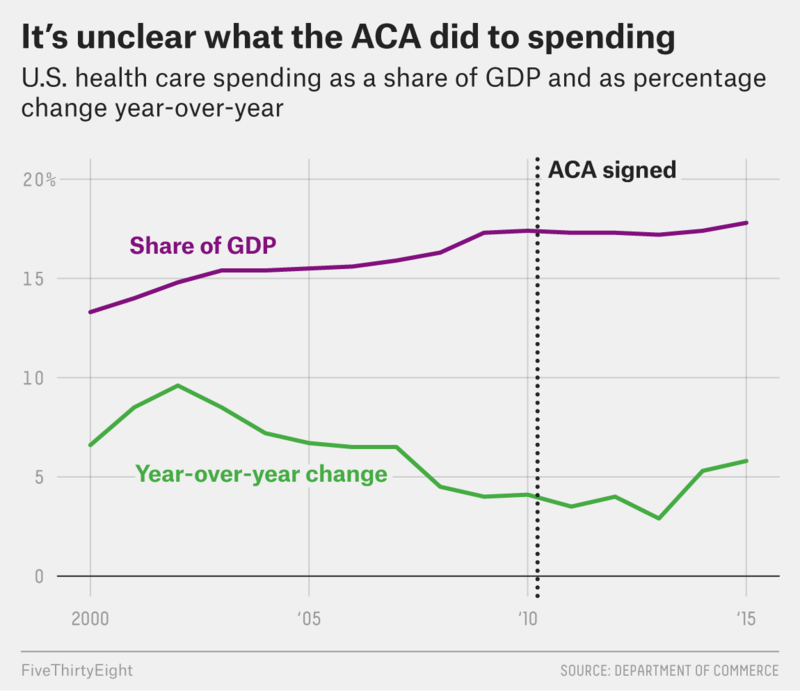 The ACA did a lot to change how health care dollars are spent, however. The U.S. is increasingly moving toward health care payment models that reward providers for health improvement, rather than paying set fees for individual services. This change is meant to reward approaches that keep people healthy, thereby reducing costs in the long run, rather than simply paying per procedure, which can encourage doctors and hospitals to perform more testing and surgery than may be necessary. Many of these efforts have only recently begun, so it’s too soon to say whether they might curb spending. The law has also made costs more transparent. Most reports on pre-ACA premiums only give a sense of what a plan would cost before the policyholder’s age, gender and health status were taken into account, considerations that often raised the cost of premiums beyond list prices. While that makes it difficult to compare what people pay for plans sold on the current marketplace to what they paid for private insurance plans before the ACA, we can now compare how much people pay for similar coverage in different parts of the country. Similarly, under the Obama administration, far more data detailing Medicare costs has been released than was made public under any previous president, providing new insight into federal spending on health care. “I don’t give Obama credit for much,” Miller said, “but I’ll give him credit for that.” The increased transparency could inform not only future efforts to control spending, but also how health care policy changes are evaluated going forward. Not only is overall spending growing, but the amount that individuals are paying is rising as well. The average amount that people with employer-sponsored plans spent on premiums and deductibles in 2015 was equivalent to 10.1 percent of the median U.S. income, meaning people with moderate incomes were likely spending a tenth of their income on health costs, compared with 6.5 percent in 2006. But there are dramatic geographic variations in what people pay, with some places faring better under the law than others. States that did not expand Medicaid and had problems with competition in the health insurance market before the law passed tend to have insurance marketplaces with fewer options and higher premiums today. And though premiums and deductibles are rising, the blame doesn’t necessarily fall on the ACA. Among employer-sponsored plans, where we have better data than we have for the private marketplace, employee contributions were not only growing before the law kicked in, but they also grew faster before 2010 than they have since, according to a study by the Commonwealth Fund, a foundation that studies health care. Although the law limits out-of-pocket spending, those limits can easily rise above $10,000 for families. Still, the percentage of families who say they’ve had problems paying medical bills has gone down, from 21.3 percent in 2011 to 16.2 percent in 2016, according to the National Center for Health Statistics. 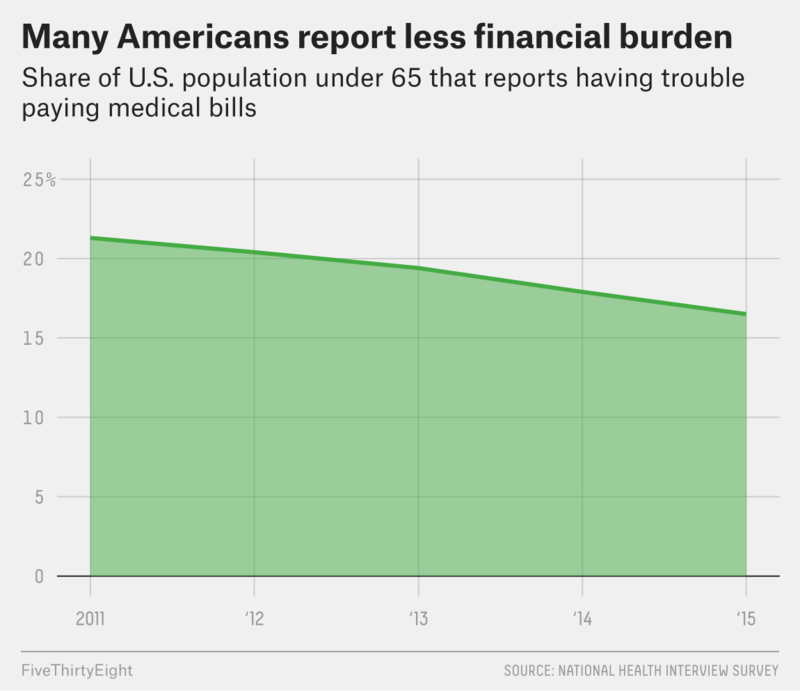 And while rising out-of-pocket costs are a financial concern for individuals, they may not be entirely bad for the country overall. Research has consistently shown that cost-sharing strategies — things like deductibles and copays — reduce health care use, which cuts spending. The question is whether those savings come from cutting out unnecessary medical care or from delaying or skimping on the care people need to be healthy. Obama’s administration says it’s awaiting more granular data to answer that question. “That’s interesting both for figuring out how much value coverage is creating for people, but also for figuring out downstream what health outcomes are improving,” said Matt Fiedler, the chief economist for Obama’s Council of Economic Advisers. The main measure of health care quality is whether people are healthier. It’s too soon to say much about what effects the law has had on the health of the nation, but we have some early indicators. One study found that self-reported health has improved, as has access to a primary care physician and prescription drugs. Another found evidence that Medicaid expansion has increased the detection of various health conditions. Other clues come from a randomized controlled trial on Medicaid expansion in Oregon that started in 2008. Potential Medicaid enrollees were randomly selected through a lottery, which allowed researchers to look specifically at the impacts of having coverage versus not having coverage. It’s rare to have data on public policy like this — randomized controlled trials are considered the gold standard in public health — and the program has been heavily scrutinized, with different groups drawing different conclusions from what’s been seen so far. People newly enrolled in Medicaid did not show measurable improvements to their physical health, but experts argue that the sample size is too small to say whether there has been improvement. However, people in the program were more likely to report that their health was the same as or better than it was the year before, and there was a decrease in the rate of depression among enrollees. Use of the emergency room, which is much more expensive than care in other settings, increased — it had been expected to decrease — making it unclear how much expanded Medicaid coverage would reduce overall spending in the long term. But as financial insurance, the plan was a success: Catastrophic health costs (defined as out-of-pocket expenses that total more than 30 percent of a household’s income) were virtually eliminated for enrollees, while they affected 5.5 percent of the group not assigned to receive coverage. Medical debt and the percentage of people who had to borrow money to pay medical bills also went down. The Oregon study is sort of a microcosm of the national health care landscape. It’s clear that coverage increased, but questions about the quality and cost remain. And importantly, as with the ACA, it’s too soon to say definitively what the long-term effects on health or spending will be. If the changes promised by the GOP come to fruition, we’ll never know what the full effect of the ACA would have been, good or bad. But because the law has already led to so many changes, any policy enacted during Trump’s presidency will by necessity be a response to the Affordable Care Act. No matter what happens next, Obama has forever left his mark on the U.S. health care landscape. CORRECTION (March 16, 3:45 p.m.): An earlier version of the first chart in this article contained incorrect data for the share of people without insurance; it included people of all ages, though it should have included only people under 65. The chart also misstated the category of Americans shown: They are people under 65 with employer-sponsored insurance, not employee-sponsored insurance. The chart has been corrected.